We offer a fully equipped kitchen, a common living room, fresh linens, internet, laundry, coffee shop, and outdoor activities from hiking the popular 'Israel trail' (wich is right outside our doorsteps), relaxing at the beach, surfing, kayaking, horseback riding, guided tours in the village and more. 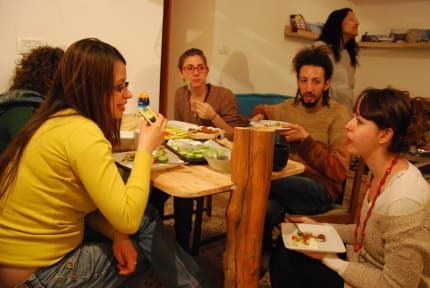 we are part of ILH-israel hostels, a network of Israeli hostels with European standards of cleanliness, true backpacker's vibes and affordable rates. ILH mission is to support indepentent travelers and make your trip to Israel a unique travel experience. definitely worth a trip to this awesome hostel in an arab coastal town in Israel! Very friendly town and the staff here cannot do enough for you! This is a very friendly hostel and staff! Not the standard hostel at a standard place, as such it definitely adds to an Isreal roundtrip. Very good hostel! Located in a lovely little Arab town on the Israeli coast, a fascinating and great place to explore and learn about. Highly recommend! The reviews and given information do not accurately represent this hostel, while the staff is friendly the location is not good. This hostel is in a run down coastal town and nothing else about this hostel stands out as above average. Walk to Caesarea is 1 hour or more, not the 30 minutes mentioned in description (google can tell you as much).